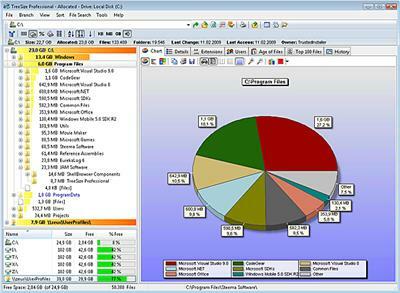 TreeSize Professional is a powerful and flexible hard disk space manager for Windows 8/7/Vista/XP or Windows Server 2012/2008/2003 (32 or 64 Bit). Find out which folders are the largest on your drives and recover precious disk space. Use TreeSize as a hard disk cleanup tool, find space hogs and remove them. Graphical analyses provide a quick visualization of your disk space usage. TreeSize Professional shows you the size, allocated and wasted disk space number of files, 3D charts, the last access date, the file owner and permissions, the NTFS compression rate and much more information for selected folders or drives. The integrated versatile file search helps you find old, big, temporary, and duplicate files on drives, entire servers or the entire network. Search results can be moved, deleted or exported. You can print detailed reports or export the collected data to different formats (XML, XLS, TXT, CSV and many more). The application has an intuitive Explorer-like user interface and supports drag-and-drop. It is fast, multi-threaded and supports Unicode and NTFS specific features. TreeSize Professional can be started from the context menu of every folder or drive.